I don't like using Roasting Pans only once or twice a year. I know people who end up storing their roaster in the garage and only bring it out for a rare special occasion, like roasting a turkey. For those people who only cook for smaller numbers, there are suggestions for you on this page as well. Someone once suggested using the oven's broiler pan for roasting. Just use a wire rack in the bottom of the broiler pan to keep the food out of the drippings. This seems reasonable, but I have one concern about using my broiler ...the sides are too low. You risk having juices spilling into the oven. What Is a "Good Roasting Pan? Most look like the one pictured here. This one is an excellent choice. It is made by "All Clad," a very good manufacturer. You can read about it by clicking on the online resource at the bottom of this page. 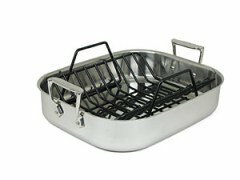 You should choose a heavy-weight pan with good heat conducting qualities like tri-ply stainless steel. These pans are also made of aluminum with non-stick surfaces, anodized aluminum, lined copper and granite. I do not care for non-stick or anodized roasting pans because it is difficult to see the color of the juice of the roast or turkey or chicken or Cornish game hen being cooked. Low sides allow the heat from the oven to expose the entire surface of the meat to create a browned exterior. But the sides can't be too low or you'll be facing the same problem as the broiler idea. Rectangular shaped pans allow for more volume (big birds, rump roasts) than some other shapes. Other than that, the shape of the pan doesn't really matter. A roasting pan does need to be "sized" for your oven AND the food you cook most often. Select a size that allows about 1 1/2- 2 inches of space between the side of the pan and the meat you intend to cook. There should also be a minimum of 2 inches of space between the outside of your pan and the sides of the oven for proper air circulation. A good roasting pan will have well-constructed handles. These are especially helpful when pulling the hot pan from the oven. Your roaster should have a rack to hold the food out of the drippings and to allow the heat to reach its underside. If food sits in its own juices it will stew instead of browning. I have an online source listed below so you can research more about roasting pans, but before you do, I want to recommend an alternative to the standard (sometimes little used roaster), especially if you don't roast big, 25 pound turkeys. The picture on the left is a tri-ply oval three-piece roaster. This unique cookware set has the versatility to cook a multitude of dishes on either the stovetop or in the oven. The largest of the three pieces is a 7-quart oval roaster that measures 15-1/2 by 11 inches with 4-inch-deep sides. Sized to cook a whole chicken or a small turkey. The roaster also doubles as a stovetop stock pot for making stews and soups! The second oval pan in this set is smaller, with a capacity of 3 quarts and measuring 15 by 10-3/4 inches, and is better suited for roasting sweet potato spears or caramelizing onions due to its shallower 1-1/2-inch sides. 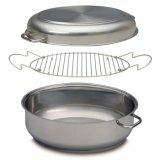 This smaller pan also works as a stovetop skillet for cooking burgers or browning pork medallions and is a lid for the larger roaster. The third and final piece is a rack, which fits within the main roaster and drains juices and fat away from meat. So with this "multi-roaster," you can roast, sauté and bake! That's what I call getting your money's worth! It's my favorite choice. I hope you found this information about roasters useful. Please don't forget to read the other cookware articles on the website.